The tally of injured in assaults, fights, and stabbings during France's "yellow vest" protests against fuel price hikes has jumped to more than 400 after a restive night. The protests, largely orchestrated on social media and which aimed to prevent road access to some fuel depots and airports, have also drawn broader support from some voters dissatisfied with Mr Macron's economic reforms and his governing style. The protester was killed when a driver caught in traffic accelerated in a panic at Pont-de-Beauvoisin, near Chambery, said Louis Laugier, the prefect, or top state official, in the eastern Savoie region. At least 227 people were injured across France, including six seriously, according to the interior ministry, which estimated that almost 283,000 demonstrators took part in Saturday's protests. By early evening, 73 people had been taken into custody, and some demonstrators were still in place at nightfall. Protests were reported Sunday several regions across France. She accidentally struck and killed a woman in her 60s, the interior ministry said. 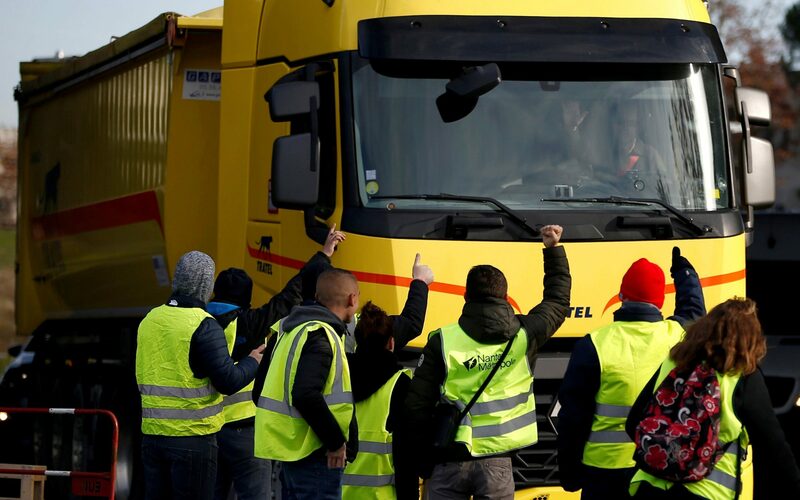 The "yellow-vest" movement called for people wearing high-visibility jackets to block motorway exits, fuel depots and roundabouts in hundreds of events planned across France. With nearly 80 per cent of the public backing the "yellow vest" protests, the president held a crisis meeting to find ways of softening the impact on the poor and came up with a raft of sweeteners worth around €500 million. Drivers blocked roads across the country in a new challenge to embattled President Emmanuel Macron. Riot police used tear gas to drive protesters away from the residence of President Emmanuel Macron last night after a day of rage against the government in which more than a quarter of a million people blocked roads at more than 2,300 points across the country from Brittany in the west to the Côte d'Azur in the south. "Macron is the president of the rich and not the poor". The taxes are part of Macron's strategy to wean France off fossil fuels. Taxes on diesel fuel have gone up 7 euro cents (nearly 8 US cents) and are to keep climbing in the coming years, Transport Minister Elisabeth Borne has said. And in a TV interview this week Macron admitted that he had "not succeeded in reconciling the French with their leaders" and "we have probably not given them enough consideration". Protesters bloc the traffic on the Place de la Concorde in Paris.